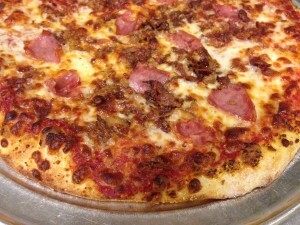 Congratulations to Drew T for submitting the November pizza of the month! This month’s featured pizza is the Tyson’s Special, a delicious combination of bacon and ham over our traditional red sauce and covered with 100% Real cheese on thin crust. Is your favorite pizza menu worthy? Submit your idea in our Fox’s customer pizza of the month promotion! Your pizza may be featured on our menu, and each month one lucky customer will receive a 21 slice Big Daddy pizza as our customer of the month.